Herpesviruses entering a host cell by membrane fusion (PNAS 105: 10559). Structure of SIV env complex in situ (PLoS Pathogens 2: e83). Cells constitute the smallest autonomous units of life. Supramolecular complexes carry out essentially all functions and processes and form the cells structural elements. The tightly regulated structural and functional organization of a cell at this level is currently only rudimentary understood. A comprehensive analysis of this organization and its dynamic changes requires tools that allow for studying these complexes in their native environment. We apply electron cryo tomography (cryo-ET) in combination with other techniques to approach selected aspects of this highly ordered network analyzing protein complexes in situ. Sample preparation by fast vitrification, i.e. embedding in amorphous ice, ensures excellent preservation of structure down to the atomic level. We have pioneered the application of cryo-ET to isolated pleomorphic viruses revealing their three-dimensional supramolecular organization. Examples are virions of Herpes simplex virus, HIV-1 and Uukuniemivirus. More recently we have moved towards cell biology of virus infection. Understanding the entirety of a virus’ ‘life cycle’ requires an understanding of its transient structures at the molecular level. The aim is a comprehensive picture of the functional interaction between viral protein complexes and cellular structures in the course of the infection. Viruses also serve as dedicated tools to mine the molecular detail of cellular tomograms. Being able to enter cells via physiological pathways and being recognizable among the multitude of other structural features inside the hosts cytoplasm viruses allow following dynamic cellular processes. Cryo electron microscopy provides an excellent platform for interactions with other approaches, like biochemical and X-ray crystallographic studies and integration of these results with native sub-cellular structural information. We are involved in various efforts of methods development including the combination of cryo electron tomographic imaging with ‘single particle’ approaches, fluorescence microscopy and X-ray microscopy/tomography in a correlative fashion, proteomics and frozen hydrated sectioning. Enveloped viruses enter their host cells by membrane fusion. The process of attachment and fusion in retroviruses is mediated by a single viral envelope glycoprotein (Env). Conformational changes of Env in the course of fusion are a focus of intense studies. Here we provide further insight into the changes occurring in retroviral Env during its initial interaction with the cell, employing murine leukemia virus (MLV) as model system. We first determined the structure of both natively membrane anchored MLV Env and MLV Env tagged with YFP in the proline rich region (PRR) by electron cryo tomography (cET) and sub-volume averaging. At a resolution of ∼20Å, native MLV Env presents as a hollow trimer (height ∼85Å, diameter ∼120Å) composed of step-shaped protomers. The major difference to the YFP-tagged protein was in regions outside of the central trimer. Next, we focused on elucidating the changes in MLV Env upon interaction with a host cell. Virus interaction with the plasma membrane occurred over a large surface and Env clustering on the binding site was observed. Sub-volume averaging did yield a low-resolution structure of Env interacting with the cell, which had lost its threefold symmetry and was elongated by ∼35Å in comparison to the unbound protein. This indicates a major rearrangement of Env upon host cell binding. At the site of virus interaction, the otherwise clearly defined bilayer structure of the host cell plasma membrane was much less evident, indicative of integral membrane protein accumulation and/or a change in membrane lipid composition. Electron cryo-tomography (cryoET) is currently the only technique that allows the direct observation of proteins in their native cellular environment. Sub-volume averaging of electron tomograms offers a route to increase the signal-to-noise of repetitive biological structures, such improving the information content and interpretability of tomograms. We discuss the potential for sub-volume averaging in highlighting and investigating specific processes in situ, focusing on microtubule structure and viral infection. We show that (i) in situ sub-volume averaging from single tomograms can guide and complement segmentation of biological features, (ii) the in situ determination of the structure of individual viruses is possible as they infect a cell, and (iii) novel, transient processes can be imaged with high levels of detail. Many viruses are enveloped by a lipid bilayer acquired during assembly, which is typically studded with one or two types of glycoproteins. These viral surface proteins act as the primary interface between the virus and the host. Entry of enveloped viruses relies on specialized fusogen proteins to help merge the virus membrane with the host membrane. In the multicomponent herpesvirus fusion machinery, glycoprotein B (gB) acts as this fusogen. Although the structure of the gB ectodomain postfusion conformation has been determined, any other conformations (e.g., prefusion, intermediate conformations) have so far remained elusive, thus restricting efforts to develop antiviral treatments and prophylactic vaccines. Here, we have characterized the full-length herpes simplex virus 1 gB in a native membrane by displaying it on cell-derived vesicles and using electron cryotomography. Alongside the known postfusion conformation, a novel one was identified. Its structure, in the context of the membrane, was determined by subvolume averaging and found to be trimeric like the postfusion conformation, but appeared more condensed. Hierarchical constrained density-fitting of domains unexpectedly revealed the fusion loops in this conformation to be apart and pointing away from the anchoring membrane. This vital observation is a substantial step forward in understanding the complex herpesvirus fusion mechanism, and opens up new opportunities for more targeted intervention of herpesvirus entry. Although nucleo-cytoplasmic transport is typically mediated through nuclear pore complexes, herpesvirus capsids exit the nucleus via a unique vesicular pathway. Together, the conserved herpesvirus proteins pUL31 and pUL34 form the heterodimeric nuclear egress complex (NEC), which, in turn, mediates the formation of tight-fitting membrane vesicles around capsids at the inner nuclear membrane. Here, we present the crystal structure of the pseudorabies virus NEC. The structure revealed that a zinc finger motif in pUL31 and an extensive interaction network between the two proteins stabilize the complex. Comprehensive mutational analyses, characterized both in situ and in vitro, indicated that the interaction network is not redundant but rather complementary. Fitting of the NEC crystal structure into the recently determined cryoEM-derived hexagonal lattice, formed in situ by pUL31 and pUL34, provided details on the molecular basis of NEC coat formation and inner nuclear membrane remodeling. Vesicular nucleo-cytoplasmic transport is becoming recognized as a general cellular mechanism for translocation of large cargoes across the nuclear envelope. Cargo is recruited, enveloped at the inner nuclear membrane (INM), and delivered by membrane fusion at the outer nuclear membrane. To understand the structural underpinning for this trafficking, we investigated nuclear egress of progeny herpesvirus capsids where capsid envelopment is mediated by two viral proteins, forming the nuclear egress complex (NEC). Using a multi-modal imaging approach, we visualized the NEC in situ forming coated vesicles of defined size. Cellular electron cryo-tomography revealed a protein layer showing two distinct hexagonal lattices at its membrane-proximal and membrane-distant faces, respectively. NEC coat architecture was determined by combining this information with integrative modeling using small-angle X-ray scattering data. The molecular arrangement of the NEC establishes the basic mechanism for budding and scission of tailored vesicles at the INM. We introduce a method for correlative in-resin super-resolution fluorescence and electron microscopy (EM) of biological structures in mammalian culture cells. Cryo-fixed resin embedded samples offer superior structural preservation, performing in-resin super-resolution, however, remains a challenge. We identified key aspects of the sample preparation procedure of high pressure freezing, freeze substitution and resin embedding that are critical for preserving fluorescence and photo-switching of standard fluorescent proteins, such as mGFP, mVenus and mRuby2. This enabled us to combine single molecule localization microscopy with transmission electron microscopy imaging of standard fluorescent proteins in cryo-fixed resin embedded cells. We achieved a structural resolution of 40-50 nm (~17 nm average single molecule localization accuracy) in the fluorescence images without the use of chemical fixation or special fluorophores. Using this approach enabled the correlation of fluorescently labeled structures to the ultrastructure in the same cell at the nanometer level and superior structural preservation. Three-dimensional electron microscopy is an enormously powerful tool for structural biologists. It is now able to provide an understanding of the molecular machinery of cells, disease processes and the actions of pathogenic organisms from atomic detail through to the cellular context. However, cutting-edge research in this field requires very substantial resources for equipment, infrastructure and expertise. Here, a brief overview is provided of the plans for a UK national three-dimensional electron-microscopy facility for integrated structural biology to enable internationally leading research on the machinery of life. State-of-the-art equipment operated with expert support will be provided, optimized for both atomic-level single-particle analysis of purified macromolecules and complexes and for tomography of cell sections. The access to and organization of the facility will be modelled on the highly successful macromolecular crystallography (MX) synchrotron beamlines, and will be embedded at the Diamond Light Source, facilitating the development of user-friendly workflows providing near-real-time experimental feedback. UNLABELLED: Nuclear delivery of the adenoviral genome requires that the capsid cross the limiting membrane of the endocytic compartment and traverse the cytosol to reach the nucleus. This endosomal escape is initiated upon internalization and involves a highly coordinated process of partial disassembly of the entering capsid to release the membrane lytic internal capsid protein VI. Using wild-type and protein VI-mutated human adenovirus serotype 5 (HAdV-C5), we show that capsid stability and membrane rupture are major determinants of entry-related sorting of incoming adenovirus virions. Furthermore, by using electron cryomicroscopy, as well as penton- and protein VI-specific antibodies, we show that the amphipathic helix of protein VI contributes to capsid stability by preventing premature disassembly and deployment of pentons and protein VI. Thus, the helix has a dual function in maintaining the metastable state of the capsid by preventing premature disassembly and mediating efficient membrane lysis to evade lysosomal targeting. Based on these findings and structural data from cryo-electron microscopy, we suggest a refined disassembly mechanism upon entry. IMPORTANCE: In this study, we show the intricate connection of adenovirus particle stability and the entry-dependent release of the membrane-lytic capsid protein VI required for endosomal escape. We show that the amphipathic helix of the adenovirus internal protein VI is required to stabilize pentons in the particle while coinciding with penton release upon entry and that release of protein VI mediates membrane lysis, thereby preventing lysosomal sorting. We suggest that this dual functionality of protein VI ensures an optimal disassembly process by balancing the metastable state of the mature adenovirus particle. Membrane protein-enriched extracellular vesicles (MPEEVs) provide a platform for studying intact membrane proteins natively anchored with the correct topology in genuine biological membranes. This approach circumvents the need to conduct tedious detergent screens for solubilization, purification, and reconstitution required in classical membrane protein studies. We have applied this method to three integral type I membrane proteins, namely the Caenorhabditis elegans cell-cell fusion proteins AFF-1 and EFF-1 and the glycoprotein B (gB) from Herpes simplex virus type 1 (HSV1). Electron cryotomography followed by subvolume averaging allowed the 3D reconstruction of EFF-1 and HSV1 gB in the membrane as well as an analysis of the spatial distribution and interprotein interactions on the membrane. MPEEVs have many applications beyond structural/functional investigations, such as facilitating the raising of antibodies, for protein-protein interaction assays or for diagnostics use, as biomarkers, and possibly therapeutics. Many viruses deliver their genomes into the nucleoplasm for viral transcription and replication. Here, we describe a novel cell-free system to elucidate specific interactions between viruses and nuclear pore complexes (NPCs). Nuclei reconstituted in vitro from egg extracts of Xenopus laevis, an established biochemical system to decipher nuclear functions, were incubated with GFP-tagged capsids of herpes simplex virus, an alphaherpesvirus replicating in the nucleus. Capsid binding to NPCs was analyzed using fluorescence and field emission scanning electron microscopy. Tegument-free capsids or viral capsids exposing inner tegument proteins on their surface bound to nuclei, while capsids inactivated by a high-salt treatment or covered by inner and outer tegument showed less binding. There was little binding of the four different capsid types to nuclei lacking functional NPCs. This novel approach provides a powerful system to elucidate the molecular mechanisms that enable viral structures to engage with NPCs. Furthermore, this assay could be expanded to identify molecular cues triggering viral genome uncoating and nuclear import of viral genomes. Actin and actin-binding proteins are incorporated into HIV-1 particles, and F-actin has been suggested to bind the NC domain in HIV-1 Gag. Furthermore, F-actin has been frequently observed in the vicinity of HIV-1 budding sites by cryo-electron tomography (cET). Filamentous structures emanating from viral buds and suggested to correspond to actin filaments have been observed by atomic force microscopy. To determine whether the NC domain of Gag is required for actin association with viral buds and for actin incorporation into HIV-1, we performed comparative analyses of virus-like particles (VLPs) obtained by expression of wild-type HIV-1 Gag or a Gag variant where the entire NC domain had been replaced by a dimerizing leucine zipper [Gag(LZ)]. The latter protein yielded efficient production of VLPs with near-wild-type assembly kinetics and size and exhibited a regular immature Gag lattice. Typical HIV-1 budding sites were detected by using cET in cells expressing either Gag or Gag(LZ), and no difference was observed regarding the association of buds with the F-actin network. Furthermore, actin was equally incorporated into wild-type HIV-1 and Gag- or Gag(LZ)-derived VLPs, with less actin per particle observed than had been reported previously. Incorporation appeared to correlate with the relative intracellular actin concentration, suggesting an uptake of cytosol rather than a specific recruitment of actin. Thus, the NC domain in HIV-1 Gag does not appear to have a role in actin recruitment or actin incorporation into HIV-1 particles. Importance: HIV-1 particles bud from the plasma membrane, which is lined by a network of actin filaments. Actin was found to interact with the nucleocapsid domain of the viral structural protein Gag and is incorporated in significant amounts into HIV-1 particles, suggesting that it may play an active role in virus release. Using electron microscopy techniques, we previously observed bundles of actin filaments near HIV-1 buds, often seemingly in contact with the Gag layer. Here, we show that this spatial association is observed independently of the proposed actin-binding domain of HIV-1. The absence of this domain also did not affect actin incorporation and had a minor effect on the viral assembly rate. Furthermore, actin was not enriched in the virus compared to the average levels in the respective producing cell. Our data argue against a specific recruitment of actin to HIV-1 budding sites by the nucleocapsid domain of Gag. Studying biological structures with fine details does not only require a microscope with high resolution, but also a sample preparation process that preserves the structures in a near-native state. Live-cell imaging is restricted mostly to the field of light microscopy. For studies requiring much higher resolution, fast freezing techniques (vitrification) are successfully used to immobilize the sample in a near-native state for imaging with electron and X-ray cryo-microscopy. Fluorescence cryo-microscopy combines imaging of vitrified samples with the advantages of fluorescence labeling of biological structures. Technical considerations as well as the behavior of fluorophores at low temperatures have to be taken into account for developing or adapting super-resolution methods under cryo conditions to exploit the full potential of this technique. We introduce a super-resolution technique for fluorescence cryo-microscopy based on photoswitching of standard genetically encoded fluorescent marker proteins in intact mammalian cells at low temperature (81 K). Given the limit imposed by the lack of cryo-immersion objectives, current applications of fluorescence cryo-microscopy to biological specimens achieve resolutions between 400-500 nm only. We demonstrate that the single molecule characteristics of reversible photobleaching of mEGFP and mVenus at liquid nitrogen temperature are suitable for the basic concept of single molecule localization microscopy. This enabled us to perform super-resolution imaging of vitrified biological samples and to visualize structures in unperturbed fast frozen cells for the first time with a structural resolution of ∼125 nm (average single molecule localization accuracy ∼40 nm), corresponding to a 3-5 fold resolution improvement. Correlative fluorescence and soft X-ray cryo-microscopy/tomography on flat sample holders is perfectly suited to study the uncompromised physiological status of adherent cells at its best possible preservation by imaging after fast cryo-immobilization. To understand the mechanism by which herpesviruses induce nucleoplasmic reticulum, i.e. invaginations of the nuclear envelope, during their egress from the host cell nucleus, morphologically similar structures found in laminopathies and after chemical induction were investigated as a potentially more easily accessible model system. For example, anti-retroviral protease inhibitors like Saquinavir also induce invaginations of the nuclear membranes. With the help of newly designed multimodal nanoparticles as alignment and correlation markers, and by optimizing fluorescence cryo-microscopy data acquisition, an elaborate three-dimensional network of nucleoplasmic reticulum was demonstrated in nuclei of Saquinavir-treated rabbit kidney cells expressing a fluorescently labeled inner nuclear membrane protein. In part of the protease inhibitor-treated samples, nuclei exhibited dramatic ultrastructural changes indicative of programmed cell death/apoptosis. This unexpected observation highlights another unique feature of soft X-ray microscopy, i.e. high absorption contrast information not relying on labeled cellular components, at a 3D resolution of approximately 40 nm (half-pitch) and through a sample thickness of several micrometers. These properties make it a valuable part of the cell biology imaging toolbox to visualize the cellular ultrastructure in its completeness. Fusogens are membrane proteins that remodel lipid bilayers to facilitate membrane merging. Although several fusogen ectodomain structures have been solved, structural information on full-length, natively membrane-anchored fusogens is scarce. Here we present the electron cryo microscopy three-dimensional reconstruction of the Caenorhabditis elegans epithelial fusion failure 1 (EFF-1) protein natively anchored in cell-derived membrane vesicles. This reveals a membrane protruding, asymmetric, elongated monomer. Flexible fitting of a protomer of the EFF-1 crystal structure, which is homologous to viral class-II fusion proteins, shows that EFF-1 has a hairpin monomeric conformation before fusion. These structural insights, when combined with our observations of membrane-merging intermediates between vesicles, enable us to propose a model for EFF-1 mediated fusion. This process, involving identical proteins on both membranes to be fused, follows a mechanism that shares features of SNARE-mediated fusion while using the structural building blocks of the unilaterally acting class-II viral fusion proteins. Electron cryo tomography (cryoET) is an ideal technique to study virus-host interactions at molecular resolution. Imaging of biological specimens in a frozen-hydrated state assures a close to native environment. Various virus-host cell interactions have been analysed in this way, with the herpesvirus 'life' cycle being the most comprehensively studied. The data obtained were further integrated with fluorescence and soft X-ray cryo microscopy data applied on experimental systems covering a wide range of biological complexity. This hybrid approach combines dynamic with static imaging and spans a resolution range from micrometres to angstroms. Along selected aspects of the herpesvirus replication cycle, we describe dedicated combinations of approaches and how subsequent data integration enables insights towards a functional understanding of the underlying processes. Soft X-ray cryo-microscopy/tomography with its extraordinary capability to map vitreous cells with high absorption contrast in their full three-dimensional extent, and at a resolution exceeding super-resolution fluorescence microscopy, is a valuable tool for integrative structural cell biology. Focusing on cell biological applications, its ongoing methodological development gained momentum by combining it with fluorescence cryo-microscopy, thus correlating highly resolved structural and specific information in situ. In this chapter, we provide a basic description of the techniques, as well as an overview of equipment and methods available to carry out correlative soft X-ray cryo-tomography experiments on frozen-hydrated cells grown on a planar support. Our aim here is to suggest ways that biologically representative data can be recorded to the highest possible resolution, while also keeping in mind the limitations of the technique during data acquisition and analysis. We have written from our perspective as electron cryo-microscopists/structural cell biologists who have experience using correlative fluorescence/cryoXM/T at synchrotron beamlines presently available for external users in Europe (HZB TXM at U41-FSGM, BESSY II, Berlin/Germany; Carl Zeiss TXMs at MISTRAL, ALBA, Barcelona/Spain, and B24, DLS, Oxfordshire, UK). Correlative light and electron microscopy (CLEM) is an emerging technique which combines functional information provided by fluorescence microscopy (FM) with the high-resolution structural information of electron microscopy (EM). So far, correlative cryo microscopy of frozen-hydrated samples has not reached better than micrometre range accuracy. Here, a method is presented that enables the correlation between fluorescently tagged proteins and electron cryo tomography (cryoET) data with nanometre range precision. Specifically, thin areas of vitrified whole cells are examined by correlative fluorescence cryo microscopy (cryoFM) and cryoET. Novel aspects of the presented cryoCLEM workflow not only include the implementation of two independent electron dense fluorescent markers to improve the precision of the alignment, but also the ability of obtaining an estimate of the correlation accuracy for each individual object of interest. The correlative workflow from plunge-freezing to cryoET is detailed step-by-step for the example of locating fluorescence-labelled adenovirus particles trafficking inside a cell. Glycoprotein B (gB) is a key component of the complex herpesvirus fusion machinery. We studied membrane interaction of two gB ectodomain forms and present an electron cryotomography structure of the gB-bilayer complex. The two forms differed in presence or absence of the membrane proximal region (MPR) but showed an overall similar trimeric shape. The presence of the MPR impeded interaction with liposomes. In contrast, the MPR-lacking form interacted efficiently with liposomes. Lateral interaction resulted in coat formation on the membranes. The structure revealed that interaction of gB with membranes was mediated by the fusion loops and limited to the outer membrane leaflet. The observed intrinsic propensity of gB to cluster on membranes indicates an additional role of gB in driving the fusion process forward beyond the transient fusion pore opening and subsequently leading to fusion pore expansion. 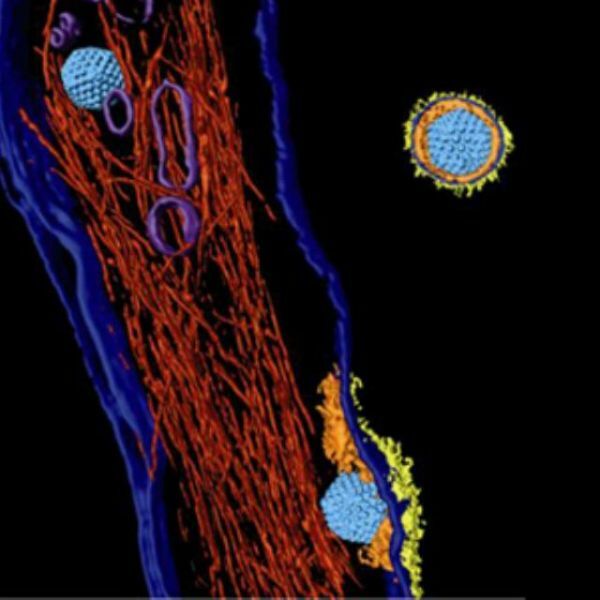 Visualizing virus-host interactions in situ inside infected cells by electron cryo-tomography provides unperturbed snapshots of the infection process. Here we focus on the assembly and egress pathway of herpesviruses. Cells infected with herpes simplex virus 1 produce and release not only infective virions but also non-infectious light particles (L-particles). L-particles are devoid of viral capsids and genomes. In this study, we analysed L-particle assembly and egress pathways in cultured dissociated hippocampus neurones by electron cryo-tomography. Virion and L-particle formation occurred in close proximity, suggesting shared assembly and exit pathways. Clathrin-like coats were occasionally associated with L-particle and virion assembly sites. Further, we compared the three-dimensional ultrastructure of intracellular and extracellular L-particles and quantified their diameters and the abundance of inclusion bodies contained. Soft X-ray cryo-microscopy/tomography of vitreous samples is becoming a valuable tool in structural cell biology. Within the 'water-window' wavelength region (2.34-4.37nm), it provides absorption contrast images with high signal to noise ratio and resolution of a few tens of nanometer. Soft X-rays with wavelengths close to the K-absorption edge of oxygen penetrate biological samples with thicknesses in the micrometer range. Here, we report on the application of a recently established extension of the transmission soft X-ray cryo-microscope (HZB TXM) at the beamline U41-XM of the BESSY II electron storage ring by an in-column epi-fluorescence and reflected light cryo-microscope. We demonstrate the new capability for correlative fluorescence and soft X-ray cryo-microscopy/tomography of this instrument along a typical life science experimental approach - the correlation of a fluorophore-tagged protein (pUL34-GFP of pseudorabies virus, PrV, the nuclear membrane-anchored component of the nuclear egress complex of the Herpesviridae which interacts with viral pUL31) in PrV pUL34-GFP/pUL31 coexpressing mammalian cells, with virus-induced vesicular structures in the nucleus, expanding the nucleoplasmic reticulum. Taken together, our results demonstrate new possibilities to study the role of specific proteins in substructures of adherent cells, especially of the nucleus in toto, accessible to electron microscopy in thinned samples only. During herpes simplex virus 1 (HSV1) egress in neurons, viral particles travel from the neuronal cell body along the axon towards the synapse. Whether HSV1 particles are transported as enveloped virions as proposed by the 'married' model or as non-enveloped capsids suggested by the 'separate' model is controversial. Specific viral proteins may form a recruitment platform for microtubule motors that catalyze such transport. However, their subviral location has remained elusive. Here we established a system to analyze herpesvirus egress by cryo electron tomography. At 16 h post infection, we observed intra-axonal transport of progeny HSV1 viral particles in dissociated hippocampal neurons by live-cell fluorescence microscopy. Cryo electron tomography of frozen-hydrated neurons revealed that most egressing capsids were transported independently of the viral envelope. Unexpectedly, we found not only DNA-containing capsids (cytosolic C-capsids), but also capsids lacking DNA (cytosolic A-/B-capsids) in mid-axon regions. Subvolume averaging revealed lower amounts of tegument on cytosolic A-/B-capsids than on C-capsids. Nevertheless, all capsid types underwent active axonal transport. Therefore, even few tegument proteins on the capsid vertices seemed to suffice for transport. Secondary envelopment of capsids was observed at axon terminals. On their luminal face, the enveloping vesicles were studded with typical glycoprotein-like spikes. Furthermore, we noted an accretion of tegument density at the concave cytosolic face of the vesicle membrane in close proximity to the capsids. Three-dimensional analysis revealed that these assembly sites lacked cytoskeletal elements, but that filamentous actin surrounded them and formed an assembly compartment. Our data support the 'separate model' for HSV1 egress, i.e. progeny herpes viruses being transported along axons as subassemblies and not as complete virions within transport vesicles. Spatial organization of membranes into domains of distinct protein and lipid composition is a fundamental feature of biological systems. The plasma membrane is organized in such domains to efficiently orchestrate the many reactions occurring there simultaneously. Despite the almost universal presence of membrane domains, mechanisms of their formation are often unclear. Yeast cells feature prominent plasma membrane domain organization, which is at least partially mediated by eisosomes. Eisosomes are large protein complexes that are primarily composed of many subunits of two Bin-Amphiphysin-Rvs domain-containing proteins, Pil1 and Lsp1. In this paper, we show that these proteins self-assemble into higher-order structures and bind preferentially to phosphoinositide-containing membranes. Using a combination of electron microscopy approaches, we generate structural models of Pil1 and Lsp1 assemblies, which resemble eisosomes in cells. Our data suggest that the mechanism of membrane organization by eisosomes is mediated by self-assembly of its core components into a membrane-bound protein scaffold with lipid-binding specificity. Caenorhabditis elegans proteins AFF-1 and EFF-1 [C. elegans fusion family (CeFF) proteins] are essential for developmental cell-to-cell fusion and can merge insect cells. To study the structure and function of AFF-1, we constructed vesicular stomatitis virus (VSV) displaying AFF-1 on the viral envelope, substituting the native fusogen VSV glycoprotein. Electron microscopy and tomography revealed that AFF-1 formed distinct supercomplexes resembling pentameric and hexameric "flowers" on pseudoviruses. Viruses carrying AFF-1 infected mammalian cells only when CeFFs were on the target cell surface. Furthermore, we identified fusion family (FF) proteins within and beyond nematodes, and divergent members from the human parasitic nematode Trichinella spiralis and the chordate Branchiostoma floridae could also fuse mammalian cells. Thus, FF proteins are part of an ancient family of cellular fusogens that can promote fusion when expressed on a viral particle. The structure of immature and mature HIV-1 particles has been analyzed in detail by cryo electron microscopy, while no such studies have been reported for cellular HIV-1 budding sites. Here, we established a system for studying HIV-1 virus-like particle assembly and release by cryo electron tomography of intact human cells. The lattice of the structural Gag protein in budding sites was indistinguishable from that of the released immature virion, suggesting that its organization is determined at the assembly site without major subsequent rearrangements. Besides the immature lattice, a previously not described Gag lattice was detected in some budding sites and released particles; this lattice was found at high frequencies in a subset of infected T-cells. It displays the same hexagonal symmetry and spacing in the MA-CA layer as the immature lattice, but lacks density corresponding to NC-RNA-p6. Buds and released particles carrying this lattice consistently lacked the viral ribonucleoprotein complex, suggesting that they correspond to aberrant products due to premature proteolytic activation. We hypothesize that cellular and/or viral factors normally control the onset of proteolytic maturation during assembly and release, and that this control has been lost in a subset of infected T-cells leading to formation of aberrant particles. Structural studies have provided detailed insights into different functional states of the ribosome and its interaction with factors involved in nascent peptide folding, processing, and targeting. However, how the translational machinery is organized spatially in native cellular environments is not yet well understood. Here we have mapped individual ribosomes in electron tomograms of intact human cells by template matching and determined the average structure of the ribosome in situ. Characteristic features of active ribosomes in the cellular environment were assigned to the tRNA channel, elongation factors, and additional densities near the peptide tunnel. Importantly, the relative spatial configuration of neighboring ribosomes in the cell is clearly nonrandom. The preferred configurations are specific for active polysomes and were largely abrogated in puromycin-treated control cells. The distinct neighbor orientations found in situ resemble configurations of bacterial polysomes in vitro, indicating a conserved supramolecular organization with implications for nascent polypeptide folding. Hantaviruses (family Bunyaviridae) are rodent-borne emerging viruses that cause a serious, worldwide threat to human health. Hantavirus diseases include hemorrhagic fever with renal syndrome and hantavirus cardiopulmonary syndrome. Virions are enveloped and contain a tripartite single-stranded negative-sense RNA genome. Two types of glycoproteins, G(N) and G(C), are embedded in the viral membrane and form protrusions, or "spikes." The membrane encloses a ribonucleoprotein core, which consists of the RNA segments, the nucleocapsid protein, and the RNA-dependent RNA polymerase. Detailed information on hantavirus virion structure and glycoprotein spike composition is scarce. Here, we have studied the structures of Tula hantavirus virions using electron cryomicroscopy and tomography. Three-dimensional density maps show how the hantavirus surface glycoproteins, membrane, and ribonucleoprotein are organized. The structure of the G(N)-G(C) spike complex was solved to 3.6-nm resolution by averaging tomographic subvolumes. Each spike complex is a square-shaped assembly with 4-fold symmetry. Spike complexes formed ordered patches on the viral membrane by means of specific lateral interactions. These interactions may be sufficient for creating membrane curvature during virus budding. In conclusion, the structure and assembly principles of Tula hantavirus exemplify a unique assembly paradigm for enveloped viruses. The glycoprotein gO (UL74) of human cytomegalovirus (HCMV) forms a complex with gH/gL. Virus mutants with a deletion of gO show a defect in secondary envelopment with the consequence that virus spread is restricted to a cell-associated pathway. Here we report that the positional homolog of HCMV gO, m74 of mouse CMV (MCMV), codes for a glycosylated protein which also forms a complex with gH (M75). m74 knockout mutants of MCMV show the same spread phenotype as gO knockout mutants of HCMV, namely, a shift from supernatant-driven to cell-associated spread. We could show that this phenotype is due to a reduction of infectious virus particles in cell culture supernatants. m74 knockout mutants enter fibroblasts via an energy-dependent and pH-sensitive pathway, whereas in the presence of an intact m74 gene product, entry is neither energy dependent nor pH sensitive. This entry phenotype is shared by HCMV expressing or lacking gO. Our data indicate that the m74 and UL74 gene products both codetermine CMV spread and CMV entry into cells. We postulate that MCMV, like HCMV, expresses alternative gH/gL complexes which govern cell-to-cell spread of the virus. Membrane fusion--a basic cellular process enabling crucial cellular functions such as membrane trafficking--is mechanistically only partially understood. 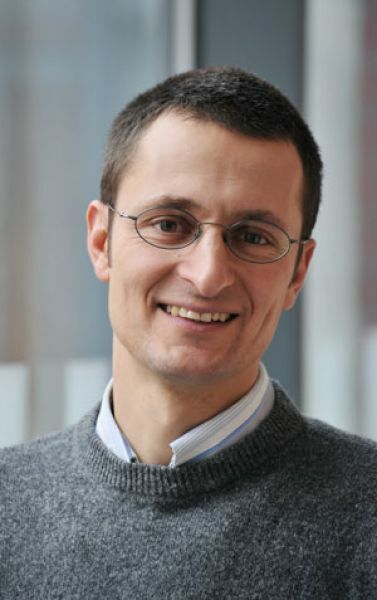 Most of the existing knowledge has come from studying host-cell entry of viruses with lipid bilayer envelopes, which proceeds through fusion of viral and host-cell membranes.Crystal structures for a number of viral fusion proteins facilitating this process have contributed substantially to our understanding. One of the next challenges is to merge these high-resolution structures of soluble parts of fusion effectors with native structural information on the proteins in the course of their functional interactions with the target membranes. 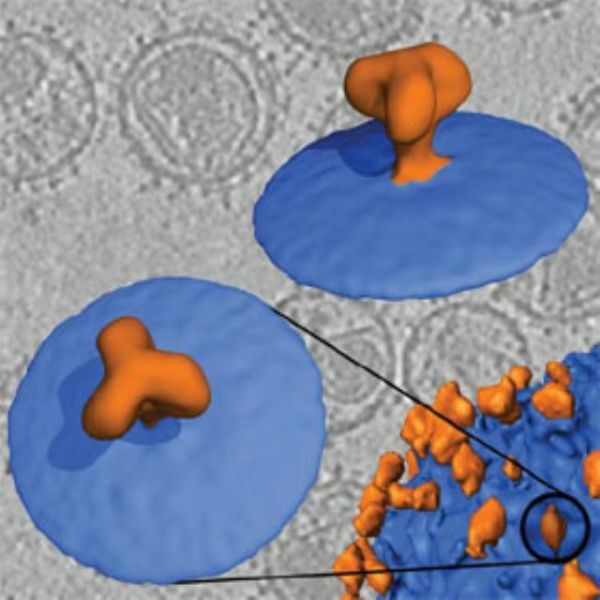 In this issue of The EMBO Journal,Lee (2010) presents an elegant example of such a study,probing the early interaction of the influenza virus with liposomes by cryo-electron tomography (cryoET). Multiple entry receptors can mediate infection of cells by herpes simplex virus (HSV), permitting alternative pathways for infection and disease. We investigated the roles of two known entry receptors, herpesvirus entry mediator (HVEM) and nectin-1, in infection of neurons in the CNS and the development of encephalitis. Wild-type, HVEM KO, nectin-1 KO, and HVEM/nectin-1 double KO mice were inoculated with HSV into the hippocampus. The mice were examined for development of encephalitis or were killed at various times after inoculation for immunohistological analyses of brain slices. Nectin-1 KO mice showed no signs of disease after intracranial inoculation, and no HSV antigens were detectable in the brain parenchyma. However, HSV antigens were detected in non-parenchymal cells lining the ventricles. In the double KO mice, there was also no disease and no detectable expression of viral antigens even in non-parenchymal cells, indicating that infection of these cells in the nectin-1 KO mice was dependent on the expression of HVEM. Wild-type and HVEM KO mice rapidly developed encephalitis, and the patterns of HSV replication in the brain were indistinguishable. Thus, expression of nectin-1 is necessary for HSV infection via the intracranial route and for encephalitis; HVEM is largely irrelevant. These results contrast with recent findings that (i) either HVEM or nectin-1 can permit HSV infection of the vaginal epithelium in mice and (ii) nectin-1 is not the sole receptor capable of enabling spread of HSV infection from the vaginal epithelium to the PNS and CNS. Rift Valley fever virus (RVFV) is a member of the genus Phlebovirus within the family Bunyaviridae. It is a mosquito-borne zoonotic agent that can cause hemorrhagic fever in humans. The enveloped RVFV virions are known to be covered by capsomers of the glycoproteins G(N) and G(C), organized on a T=12 icosahedral lattice. However, the structural units forming the RVFV capsomers have not been determined. Conflicting biochemical results for another phlebovirus (Uukuniemi virus) have indicated the existence of either G(N) and G(C) homodimers or G(N)-G(C) heterodimers in virions. Here, we have studied the structure of RVFV using electron cryo-microscopy combined with three-dimensional reconstruction and single-particle averaging. The reconstruction at 2.2-nm resolution revealed the organization of the glycoprotein shell, the lipid bilayer, and a layer of ribonucleoprotein (RNP). Five- and six-coordinated capsomers are formed by the same basic structural unit. Molecular-mass measurements suggest a G(N)-G(C) heterodimer as the most likely candidate for this structural unit. Both leaflets of the lipid bilayer were discernible, and the glycoprotein transmembrane densities were seen to modulate the curvature of the lipid bilayer. RNP densities were situated directly underneath the transmembrane densities, suggesting an interaction between the glycoprotein cytoplasmic tails and the RNPs. The success of the single-particle averaging approach taken in this study suggests that it is applicable in the study of other phleboviruses, as well, enabling higher-resolution description of these medically important pathogens. Current models of HIV-1 morphogenesis hold that newly synthesized viral Gag polyproteins traffic to and assemble at the cell membrane into spherical protein shells. The resulting late-budding structure is thought to be released by the cellular ESCRT machinery severing the membrane tether connecting it to the producer cell. Using electron tomography and scanning transmission electron microscopy, we find that virions have a morphology and composition distinct from late-budding sites. Gag is arranged as a continuous but incomplete sphere in the released virion. In contrast, late-budding sites lacking functional ESCRT exhibited a nearly closed Gag sphere. The results lead us to propose that budding is initiated by Gag assembly, but is completed in an ESCRT-dependent manner before the Gag sphere is complete. This suggests that ESCRT functions early in HIV-1 release--akin to its role in vesicle formation--and is not restricted to severing the thin membrane tether. The concerted action of four viral glycoproteins and at least one cellular receptor is required to catalyze herpes simplex virus 1 entry into host cells either by fusion at the plasma membrane or intracellularly after internalization by endocytosis. Here, we applied cryo electron tomography to capture 3D intermediates from Herpes simplex virus 1 fusion at the plasma membrane in their native environment by using two model systems: adherent cells and synaptosomes. The fusion process was delineated as a series of structurally different steps. The incoming capsid separated from the tegument and was closely surrounded by the cortical cytoskeleton. After entry, the viral membrane curvature changed concomitantly with a reorganization of the envelope glycoprotein spikes. Individual glycoprotein complexes in transitional conformations during pore formation and dilation revealed the complex viral fusion mechanism in action. Snapshots of the fusion intermediates provide unprecedented details concerning the overall structural changes occurring during herpesvirus entry. Moreover, our data suggest that there are two functional "poles" of the asymmetric herpesvirion: one related to cell entry, and the other formed during virus assembly. A method is described employing microcarrier spheres of cross-linked dextran for obtaining ultra- and semithin vitreous sections from high-pressure frozen anchorage-dependent (mammalian) cells. Avoiding trypsination or scraping cells off from the culture surface, the presented approach allows for cryoimmobilization, cryosectioning and cryoelectron microscopy/tomography of frozen-hydrated cells in an unperturbed manner which is important to preserve the native state of, for instance, the cytoskeleton. Furthermore, our studies on the 'life cycle' of Herpes simplex virus in Vero cells demonstrate that cell monolayers on microcarrier beads are well suited for fluorescence microscopic characterization of the sample prior to high-pressure freezing. Bunyaviridae is a large family of viruses that have gained attention as "emerging viruses" because many members cause serious disease in humans, with an increasing number of outbreaks. These negative-strand RNA viruses possess a membrane envelope covered by glycoproteins. The virions are pleiomorphic and thus have not been amenable to structural characterization using common techniques that involve averaging of electron microscopic images. Here, we determined the three-dimensional structure of a member of the Bunyaviridae family by using electron cryotomography. The genome, incorporated as a complex with the nucleoprotein inside the virions, was seen as a thread-like structure partially interacting with the viral membrane. Although no ordered nucleocapsid was observed, lateral interactions between the two membrane glycoproteins determine the structure of the viral particles. In the most regular particles, the glycoprotein protrusions, or "spikes," were seen to be arranged on an icosahedral lattice, with T = 12 triangulation. This arrangement has not yet been proven for a virus. Two distinctly different spike conformations were observed, which were shown to depend on pH. This finding is reminiscent of the fusion proteins of alpha-, flavi-, and influenza viruses, in which conformational changes occur in the low pH of the endosome to facilitate fusion of the viral and host membrane during viral entry. Cell entry of Simian Virus 40 (SV40) involves caveolar/lipid raft-mediated endocytosis, vesicular transport to the endoplasmic reticulum (ER), translocation into the cytosol, and import into the nucleus. We analyzed the effects of ER-associated processes and factors on infection and on isolated viruses and found that SV40 makes use of the thiol-disulfide oxidoreductases, ERp57 and PDI, as well as the retrotranslocation proteins Derlin-1 and Sel1L. ERp57 isomerizes specific interchain disulfides connecting the major capsid protein, VP1, to a crosslinked network of neighbors, thus uncoupling about 12 of 72 VP1 pentamers. Cryo-electron tomography indicated that loss of interchain disulfides coupled with calcium depletion induces selective dissociation of the 12 vertex pentamers, a step likely to mimic uncoating of the virus in the cytosol. Thus, the virus utilizes the protein folding machinery for initial uncoating before exploiting the ER-associated degradation machinery presumably to escape from the ER lumen into the cytosol. In microbiology, and in particular in virus research, electron microscopy (EM) is an important tool, offering a broad approach for investigating viral structure throughout their intracellular and extracellular life cycles. Currently, molecular tools and rapid developments in advanced light microscopy dominate the field and supply an enormous amount of information concerning virus biology. In recent years, numerous fascinating high-resolution EM structures obtained by single-particle electron cryo microscopy (cryo-EM) were revealed for viral particles that possess icosahedral symmetry. However, no comprehensive three-dimensional analysis of complex viruses or viruses within cells has yet been achieved using EM. Recent developments in electron cryo-tomography render this a proficient tool for the analysis of complex viruses and viruses within cells in greater detail. The envelope glycoprotein (Env) complexes of the human and simian immunodeficiency viruses (HIV and SIV, respectively) mediate viral entry and are a target for neutralizing antibodies. The receptor binding surfaces of Env are in large part sterically occluded or conformationally masked prior to receptor binding. Knowledge of the unliganded, trimeric Env structure is key for an understanding of viral entry and immune escape, and for the design of vaccines to elicit neutralizing antibodies. We have used cryo-electron tomography and averaging to obtain the structure of the SIV Env complex prior to fusion. Our result reveals novel details of Env organisation, including tight interaction between monomers in the gp41 trimer, associated with a three-lobed, membrane-distal gp120 trimer. A cavity exists at the gp41-gp120 trimer interface. Our model for the spike structure agrees with previously predicted interactions between gp41 monomers, and furthers our understanding of gp120 interactions within an intact spike. Infectious HIV particles contain a characteristic cone-shaped core encasing the viral RNA and replication proteins. The core exhibits significant heterogeneity in size and shape, yet consistently forms a well-defined structure. The mechanism by which the core is assembled in the maturing virion remains poorly understood. Using cryo-electron tomography, we have produced three-dimensional reconstructions of authentic, unstained HIV-1. These reveal the viral morphology with unprecedented clarity and suggest the following mechanism for core formation inside the extracellular virion: core growth initiates at the narrow end of the cone and proceeds toward the distal side of the virion until limited by the viral membrane. Curvature and closure of the broad end of the core are then directed by the inner surface of the viral membrane. This mechanism accommodates significant flexibility in lattice growth while ensuring the closure of cores of variable size and shape. Despite much progress in electron tomography, quantitative assessment of resolution has remained a problematic issue. The criteria that are used in single particle analysis, based on gauging the consistency between density maps calculated from half data sets, are not directly applicable because of the uniqueness of a tomographic volume. Here, we propose two criteria based on a cross-validation approach. One, called FSC(e/o), is based on a Fourier shell correlation comparison between tomograms calculated from the even and odd members of a tilt series. The other, called noise-compensated leave-one-out (NLOO), is based on Fourier ring correlation comparisons between an original projection and the corresponding reprojection of the tomogram calculated from all the other projections, taking into account the differing noise statistics. Plotted as a function of tilt angle, they allow assessment of the angular dependence of resolution and quality control over the series of projections. Integrated over all projections, the results give a global figure for resolution. Tests on simulated tomograms established consistency between these criteria and the FSC(ref), a correlation coefficient calculated between a known reference structure and the corresponding portion of a tomogram containing that structure. The two criteria-FSC(e/o) and NLOO-are mutually consistent when residual noise is the major resolution-limiting factor. When the size of the tilt increment becomes a significant factor, NLOO provides a more reliable criterion, as expected, although it is computationally intensive. Applicable to entire tomograms or selected structures, NLOO has also been tested on experimental tomographic data. Herpes simplex virus, a DNA virus of high complexity, consists of a nucleocapsid surrounded by the tegument-a protein compartment-and the envelope. The latter components, essential for infectivity, are pleiomorphic. Visualized in cryo-electron tomograms of isolated virions, the tegument was seen to form an asymmetric cap: On one side, the capsid closely approached the envelope; on the other side, they were separated by approximately 35 nanometers of tegument. The tegument substructure was particulate, with some short actin-like filaments. The envelope contained 600 to 750 glycoprotein spikes that varied in length, spacing, and in the angles at which they emerge from the membrane. Their distribution was nonrandom, suggesting functional clustering. Electron cryotomography has unique potential for three-dimensional visualization of macromolecular complexes at work in their natural environment. This approach is based on reconstructing three-dimensional volumes from tilt series of electron micrographs of cells preserved in their native states by vitrification. Resolutions of 5-8 nm have already been achieved and the prospects for further improvement are good. Since many intracellular activities are conducted by complexes in the megadalton range with dimensions of 20-50 nm, current resolutions should suffice to identify many of them in tomograms. However, residual noise and the dense packing of cellular constituents hamper interpretation. Recently, tomographic data have been collected on vitrified eukaryotic cells (Medalia et al., Science (2002) in press). Their cytoplasm was found to be markedly less crowded than in the prokaryotes previously studied, in accord with differences in crowding between prokaryotic and eukaryotic cells documented by other (indirect) biophysical methods. The implications of this observation are twofold. First, complexes should be more easily identifiable in tomograms of eukaryotic cytoplasm. This applies both to recognizing known complexes and characterizing novel complexes. An example of the latter-a 5-fold symmetric particle is-given. Second, electron cryotomography offers an incisive probe to examine crowding in different cellular compartments. The carotenoid biosynthetic pathway in algae and plants takes place within plastids. In these organelles, carotenoids occur either in a free form or bound to proteins. Under stress, the unicellular green alga Haematococcus pluvialis accumulates secondary carotenoids, mainly astaxanthin esters, in cytoplasmic lipid vesicles up to 4% of its dry mass. It is therefore one of the favored organisms for the biotechnological production of these antioxidative compounds. We have studied the cellular localization and regulation of the enzyme beta-carotene oxygenase in H. pluvialis that catalyzes the introduction of keto functions at position C-4 of the beta-ionone ring of beta-carotene and zeaxanthin. Using immunogold labeling of ultrathin sections and Western blot analysis of cell fractions, we discovered that under inductive conditions, beta-carotene oxygenase was localized both in the chloroplast and in the cytoplasmic lipid vesicles, which are (according to their lipid composition) derived from cytoplasmic membranes. However, beta-carotene oxygenase activity was confined to the lipid vesicle compartment. Because an early carotenogenic enzyme in the pathway, phytoene desaturase, was found only in the chloroplast (Grünewald, K., Eckert, M., Hirschberg, J., and Hagen, C. (2000) Plant Physiol. 122, 1261-1268), a transport of intermediates from the site of early biosynthetic steps in the chloroplast to the site of oxygenation and accumulation in cytoplasmic lipid vesicles is proposed. The volvocalean microalga Haematococcus pluvialis is used as a source of the ketocarotenoid astaxanthin for applications in aquaculture and the pharmaceutical and cosmetic industries. This green alga accumulates astaxanthin, mostly esterified, canthaxanthin and echinenone in lipid vesicles outside the chloroplast. This accumulation process normally but not exclusively accompanies formation of the resting state in the developmental cycle. With regard to increased bioavailability of the accumulated secondary carotenoids, the fragility of the extracellular matrix makes the flagellated state of H. pluvialis an interesting alternative to the thick-walled aplanospore state. A two-step batch cultivation scheme was developed that leads to accumulation of secondary carotenoids in flagellated cells of H. pluvialis (strain 192.80, Göttingen, Germany). Germination of green aplanospores during the first step of cultivation proceeded optimally under 30 μmol photon m-2 S-1 of white fluorescent light 20°C. For optimal induction and enhancement of carotenoid biosynthesis, the flagellated cells formed were then exposed to a decreased level of nitrate (0.4 mM KNO3) and to enhanced irradiance (150 μmol photon m-2 s-1). Under these conditions, which still permitted cell division and chlorophyll synthesis during the first two days of exposure, carotenoid accumulation in the flagellated cells reached 2% of dry mass at the fourth day of exposure. As a mixotrophic carbon source, addition of acetate at a concentration not higher than 10 mM increased carotenoid synthesis only slightly whereas partial or complete phosphate deficiency or salt stress (40 mM NaCl) did not. Recent findings on the localization in Haematococcus pluvialis of an early and a late enzyme in astaxanthin synthesis have suggested the sequential involvement of two compartments, the chloroplast (site of early synthesis) and the cytoplasmic lipid vesicles. Here the intermediate transported across the chloroplast envelope into the cytoplasm is elucidated by means of the inhibitors diphenylamine (DPA) and 2-(4-chlorophenylthio)-triethylamine (CPTA). Based on the amounts of the intermediates accumulated upon inhibitor treatment and their occurrence in the lipid vesicle fractions, it is concluded that the transport takes place after β-ionone ring cyclization. A non-vesicle mechanism of β-ionone carotenoid transport from the chloroplast towards the cytoplasmic lipid vesicles via carotenoid binding proteins is suggested. Hagen C, Grunewald K.	2000. Fosmidomycin as an inhibitor of the non-mevalonate terpenoid pathway depresses synthesis of secondary carotenoids in flagellates of the green alga Haematococcus pluvialis	JOURNAL OF APPLIED BOTANY-ANGEWANDTE BOTANIK,	74	(3-4),	pp. 137-140. The unicellular green alga Haematococcus pluvialis Flotow is known for its massive accumulation of ketocarotenoids under various stress conditions. Therefore, this microalga is one of the favored organisms for biotechnological production of these antioxidative compounds. Astaxanthin makes up the main part of the secondary carotenoids and is accumulated mostly in an esterified form in extraplastidic lipid vesicles. We have studied phytoene desaturase, an early enzyme of the carotenoid biosynthetic pathway. The increase in the phytoene desaturase protein levels that occurs following induction is accompanied by a corresponding increase of its mRNA during the accumulation period, indicating that phytoene desaturase is regulated at the mRNA level. We also investigated the localization of the enzyme by western-blot analysis of cell fractions and by immunogold labeling of ultrathin sections for electron microscopy. In spite of the fact that secondary carotenoids accumulate outside the chloroplast, no extra pathway specific for secondary carotenoid biosynthesis in H. pluvialis was found, at least at this early stage in the biosynthesis. A transport process of carotenoids from the site of biosynthesis (chloroplast) to the site of accumulation (cytoplasmatic located lipid vesicles) is implicated. Flagellates of Haematococcus pluvialis accumulate secondary carotenoids (mainly astaxanthin and its esters) under nitrogen deficiency in combination with exposure to stronger light. Our cultivation scheme allows the characterization of metabolic activities during the accumulation process without interference by formation of the resting state (aplanospores). The highest rate of secondary carotenoid biosynthesis (0.046 h-1) was observed almost simultaneously with the highest rates of cell division (0.027 h-1) and of chlorophyll biosynthesis (0.015 h-1) after 1.5 days of exposure to nitrogen limitation and higher irradiance. Photosynthetic activity was studied by oxygen evolution and chlorophyll fluorescence measurements; changes in protein components of the photosynthetic apparatus were quantified by gel electrophoresis and immunoblot analysis. Accumulation of secondary carotenoids was accompanied by an increase in photosynthetic productivity expressed on a unit chlorophyll basis. Changes in the photosynthetic apparatus occurring mainly during the first 2 days of exposure to nitrogen limitation and stronger light can be interpreted as acclimation to the increased cultivation irradiance. Photoprotective action of secondary carotenoids as a 'sunshade' was demonstrated in red flagellates exhibiting a lower blue-light-induced decrease in photosystem II efficiency as compared with red actinic light. The unicellular green algae Haematococcus pluvialis (Volvocales; Chlorophyceae) is known as one of the most promising organisms for biotechnological production of ketocarotenoids. Mainly due to their antioxidative properties and their use in fish aquaculture, these compounds are needed in increasing amounts. H. pluvialis accumulates astaxanthin and its esters as secondary carotenoids outside the chloroplast. Recently, we established a cultivation scheme for accumulation of secondary carotenoids in the flagellate state of the microalga. This enabled us to study the accumulation process independent of the processes involved in resting cell (aplanospore; hypnoblast) formation. Here we report on light and electron microscopic investigations of the transport of carotenoids from the chloroplast, the presumed site of carotenoid synthesis. During massive accumulation of secondary carotenoids we did not see any vesicle extrusion from the chloroplast into the cytoplasm but observed transport of carotenoid containing vesicles across the plasmalemma. The latter process might open new strategies to overcome the existing technological problems of ketocarotenoid isolation from resistant thick-walled aplanospores in Haematococcus biotechnology. The combination of nitrogen deprivation and increased cultivation light intensity resulted in the synthesis of secondary carotenoids in flagellates of Haematococcus lacustris. The pigment pattern was characterized by high-pressure liquid chromatography analysis during the accumulation period and in response to inhibitors of carotenoid biosynthesis (diphenylamine, norflurazon and tetcyclacis). Diphenylamine treatment resulted in (i) a decrease in ketocarotenoids and (ii) an accumulation of β-carotene and zeaxanthin due to inhibition of the β-carotene oxygenase. Our results indicate that astaxanthin synthesis in H. lacustris follows the biosynthetic pathway elucidated in the marine bacterium Agrobacterium aurantiacum.